Traders and investors of any market in the world� who learn to understand the true correlation between the psychology of market momentum and the the direction of market trends will eventually have the ability to master a reliable Stock Market Timing System that consistently enables them to maximize profits in uptrending markets, while minimizing losses when markets suddenly reverse lower. This, of course, is the key to becoming a winning momentum swing trader over the long-term. As the chart above illustrates, the model trading portfolio of our trading newsletter was carrying exposure of 140% going into late March of 2012 (200% maximum exposure is based on typical 2 to 1 brokerage margin account). On the morning of April 4, our timing model gave us the signal to exit most of our long positions, lowering our exposure to just 38% of capital in the model account. One day later, we sold the remainder of our long positions. This put us into a full 100% cash position…perfectly putting us on the sidelines while the Nasdaq fell another 10% over the next 10 weeks. 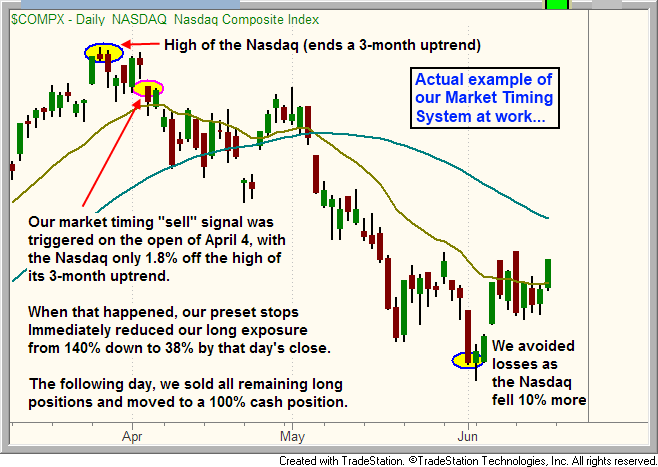 Although not shown on the chart above, we subsequently also began entering new short positions on April 20, just in time to catch the Nasdaq’s big breakdown below key support on April 23 (the following trading day). Specifically what prompted us to exit our long positions when we did was a combination of a few proprietary signals we share with our subscribers. Because our broad market timing calls, along with our specific trade entries and exits, are documented every day in our stock and ETF trading newsletter, it is important to realize we are� not utilizing any type of hindsight in writing this article (we actually never do). Many traders subscribe to our winning swing trading newsletter to receive the detailed entry and exit points of our best stock and ETF picks. However, quite a few of our members subscribe only to benefit from our objective, rule-based Market Timing Model (click here for details), which reliably indicates when to enter and exit the market with their own stock trades at the most ideal times (as shown in the chart above). For decades,� retail investors have been brainwashed into thinking the only way to make money in the stock market was to utilize a “buy and hold” strategy. The pitch was that if you just keep your money in the market when the going gets rough, such as in bear markets, the substantial upside in the good years will more than compensate for the down years, thereby leaving you with a solid annualized gain over long-term. In fairness, that was true for the approximately 20 years leading up to the new millennium. However, in case you been sleeping in a cave in recent years, times have changed.
. Yet, the average financial advisor working at any of the old-line brokerage firms will still insist that the “buy-and-hold” model is not dead, and is the only proper way to invest in the market. I will take it a step further by saying even financial advisors who actually believe the “buy-and-hold” model will no longer be very effective in the future (at least for the next several decades),� will still not tell you otherwise. Why? Because the institutional investors (banks, mutual funds, hedge funds, pension funds, etc.) need to continue perpetuating the myth in order to help promote liquidity in the markets, and in hopes of preventing future market collapses due to panic-fueled selling by the masses when they eventually figure out the actual state of affairs. This means it is crucial to follow a disciplined, rules-based Market Timing System for determining when to be heavily buying the market, when to get out of the market, and even when to (optionally) sell short. While traditional long-term “buy and hold” investing enables investors to firmly capture solid gains in uptrending markets, the problem is they frequently give back a substantial, or even majority, of their gains when the inevitable corrections come. Furthermore,� markets always decline faster than they rise, just as the Dow Jones Industrial Average surrendered 10 prior years of gains in just the 2-year decline from 2007 to 2009. We never try to sell at the absolute top of a rally, nor buy at the absolute bottom. We always look for confirmation that intermediate-term trends have reversed. But what about just trading the strongest stocks and not worrying about the rest? Perhaps you’re thinking that if you simply do short-term trading stocks and ETFs with the most relative strength to the major indices, there’s not much of a concern to worry about market timing because these stocks will outperform. To only a slight degree, this is true. If, for example, the stock market is in a confirmed uptrend, and then has a normal, lower volume correction off its highs, leading stocks and ETFs with the most relative strength will generally remain in a holding pattern or possibly continue higher despite weakness in the broad market. This is normal and healthy market action in an uptrend. However, when a confirmed downward trend reversal begins to take place among the S&P 500, Nasdaq Composite, and Dow Jones (as determined by simple moving average analysis), even the strongest equities will eventually succumb to the weight of the overall broad market’s downward pressure. At this point, it is no longer advisable to be in any positions in the long side of the market because approximately 80% of stocks always move in the direction of the dominant market trend. This is why one of the first steps of our rule-based technical swing trading system is to clearly identify the dominant direction of the main stock market indexes. Then, we simply switch to trade in the same direction of that trend (or remain heavily in cash in downtrends). This is where our Market Timing System comes into place, as it provides us with the necessary technical signals to give us just the right amount of warning time to indicate when the trend is about to reverse. Having a proper system that times the market and works effectively a majority of the time enables one to hold onto hard-earned stock market profits when market conditions head south, as they always eventually do in part of normal market cycles. Since 2002, we have been using our disciplined, rules-based system for timing the markets, which is one of the reasons we have managed to produce consistent trading profits with the detailed ETF and stock swing trader picks provided in our end-of-day stock newsletter. If so inclined, one could even study our� free archive of past� Wagner Daily stock newsletters since 2002 and see that similar defensive action was taken at the right time with most other market tops as well. Also, it is important to understand� our trading strategy is not designed to call exact tops or bottoms in the market; rather, our goal is always to “take the meat out of the middle” of a confirmed trend, which enables us to realize the maximum profit with the least amount of risk. If you are a trader who already has your own list of ETF and stock picks you like to trade, and simply need help with overall market timing, jump to� https://www.morpheustrading.com to get started with your risk-free 30-day test drive of our market timing and swing trading newsletter today. We guarantee your complete satisfaction. What are your thoughts? Is “buy and hold” dead, or merely going to be out of favor for quite a while? Please feel free to leave your comments below.